Recent release “Kelly: Adam’s Secret Dream” from Page Publishing author Gary Bengston is a story of love and Christmas magic. Adam, mourning the loss of his furry best friend, leaves a special snack for Santa’s new companion and finds a wonderful reply on Christmas morning. Gary Bengston, a businessman who enjoys raising pheasants at his farm in the beautiful Michigan Northwoods, has completed his new book “Kelly: Adam’s Secret Dream”: a heartwarming story affirming the magic of Christmas. Author Gary Bengston weaves a tale of love as a young boy dares to believe in the magic of Christmas. Told in simple prose with a touch of humor, it’s a story children, grandchildren, nieces, and nephews will treasure year after year. Published by New York City-based Page Publishing, Gary Bengston’s story begins with the sadness of losing a beloved canine companion and concludes with a magical gift of happiness on Christmas morning. 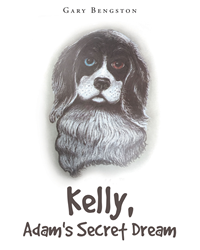 Readers who wish to experience this endearing work can purchase “Kelly: Adam’s Secret Dream” at bookstores everywhere, or online at the Apple iTunes store, Amazon, Kobo, Google Play or Barnes and Noble.